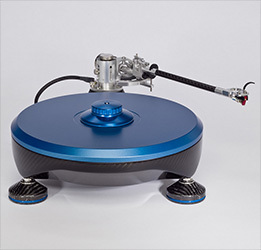 Peruse catalogues of various high-mass turntable brands. You're bound to cross paths with steam punk contraptions. Some trigger mad visions. Missile launch pads. Suspension bridges. Complex pier pylons. Then there's Alvin Lloyd's Grand Prix Audio Monaco v2. This direct drive is no bigger than a vinyl record. If you adore minimalism, c'est ça. If you enjoy gonzo erector sets or slabs of acrylic, it's the other kind. If their sort offers your favorite rose-gold finish in a custom anodize skin, even better. Both approaches work. Whilst the Grand Prix shows how mechanical excess isn't required, it says nothing about it not working. The entire industry of Swiss haute horlogerie is predicated upon not telling time better than the cheapest Casio. But no better needn't mean any worse. A plastic wrist band secures your watch as well as one crafted from lacquered alligator leather with 24-carat gold clasp. If you enjoy the latter, where's the harm? If owning a giant 350lbs turntable gives you pleasure, there's no reasonable argument against it at all! Today's assignment follows suit. A perfectly weight-rated puck of squishy Sorbothane might do the very same job. Or an Audio Physic magnetic footer. How about a LessLoss BindBreaker of swamp wood? Or a wire-hung Boenicke SwingBase? 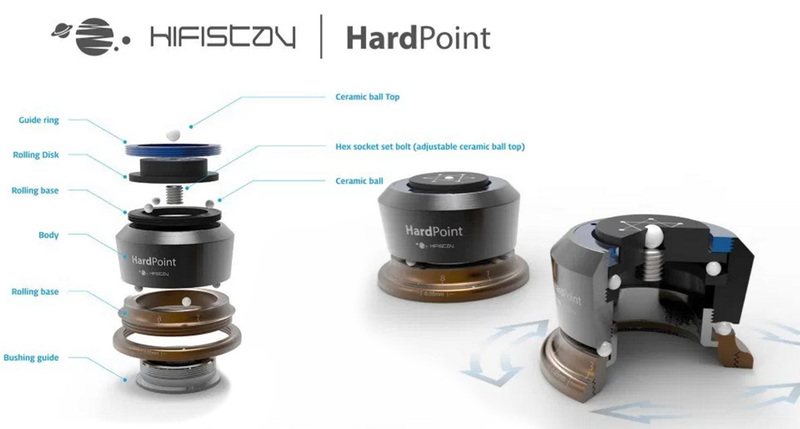 Whether made from ceramic foam or graphite, massively stacked bonded paper or ball bearings with precision races, most component supports come with a story. Some tack on an engineering white paper with accelerometer-generated graphs and Physics lessons. A thinking person wonders. 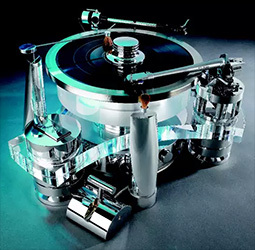 Does hifi really generate seismic shock waves of sufficient potency that our vision will blur with oscillating component chassis; that cable snakes will go live writhing across the floor; that loudspeakers will shimmy on the carpet? One does appreciate how a needle tracking tiny groove modulations on a vinyl record is another thing entirely. We imagine a laser following the microscopic lands and pits of a CD equally challenged. But what to say of vintage 6-disc car units that still don't mistrack on bumpy roads? What of ancient iPods with miniature spinning drives accompanying joggers without skips? What about solid-state drives, power conditioners and amplifiers with no moving parts? If securing such kit on resonance-attenuating interfaces improves the sound, what's really going on? Is acoustic energy from our loudspeakers sufficient to disturb battleship amps ensconced in 100lbs metal work? How? It's one thing to observe effects. It's another to assign absolute cause. 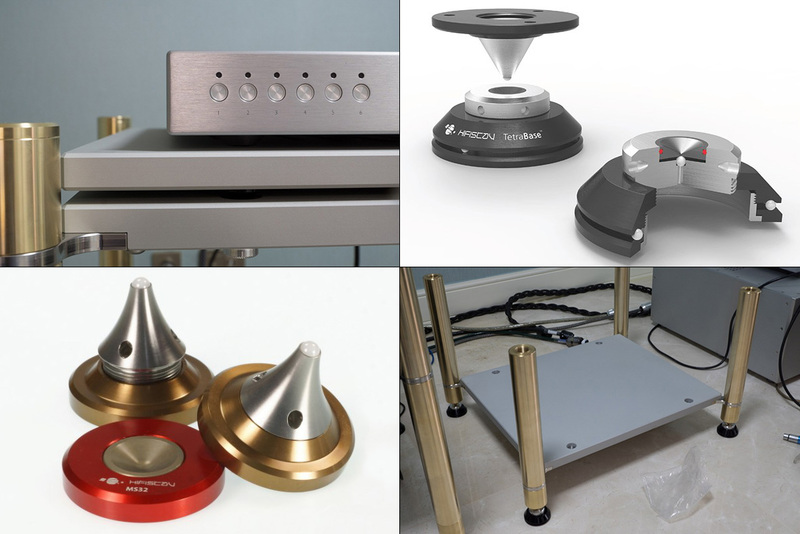 Unless we're engineers, it's good enough to make our hifi accessory purchases on the merits of personal observations. Understanding the underlying mechanics and reasons isn't required. We can speculate until the cows return. Even the shiniest theory won't dent or elevate our subjective enjoyment of the music. If we're really about such enjoyment, explanations are at best window dressing. At worst they become ammunition whereby we try to convince others to follow our path and leave theirs. Hifi fora are filled with it.